(1) Scope : Mechanical work for an external floating roof type, single deck with internal pontoon type for oil and fuel storage above ground tank. Civil foundation, cathodic protection work, fire system, cabling works and instrumentation works are not included in this calculation sheet. Engineering details design is done by Owner or EPC Contractor. (2) WBS (Work Breakdown Structure): As described on Progress Calculation/Tracking System for Oil and Fuel Storage Tank Fabrication. Method of progress calculation is the same as Progress Calculation/Tracking System for Fabrication. The only difference is construction work steps and weight factors. The details are as the following. Tank material at erection area is added as part of construction progress calculation assuming that prefabricated materials are delivered by Contractor. Once again, decision on whether it will be included or not depends on company specific requirement and client’s approval. Work steps weight factor needs to be adjusted so as to facilitate exclusion of that work step. Use the sample work steps and weight factor table below for starting point. Then, they are listed in Work steps and % weight table for physical progress calculation. See a sample table below. Two different work steps weight factor tables are made in this system as the construction method for tank external accessories is different from internal apparatus. This will help you to track the progress closely without distorting overall construction progress. Then, the sample work steps and weight factor table can be used for tank external accessories conduction physical progress measurement. 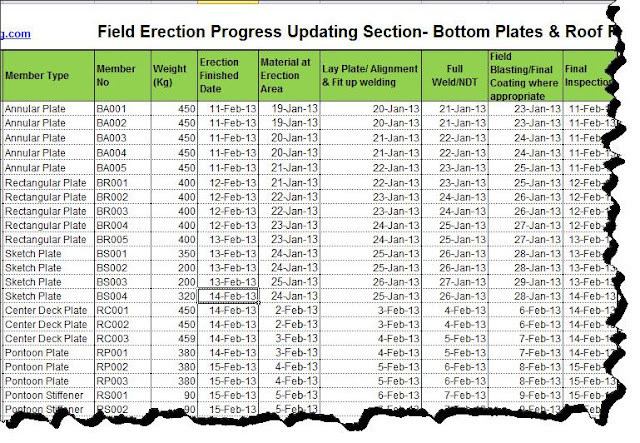 As described in fabrication progress sheet, list the tank components, man hours, weights, etc. so as to track and monitor the status of each member to high level WBS which is in line with GA drawing. Secondly, you will find the construction progress summary by quantity at the same tag “Field Installation Status-Qty”. The progress summary for an individual GA drawing is calculated so as to track the summary progress of all members for each work steps. See the snapshot below. Finally, find the "Physical Prog Tracking Sheet" tag. The quantity wise progress data is used to enter into the physical progress calculation sheet so as to measure an individual physical progress to overall progress. An individual physical progress calculation method is used in the following table. 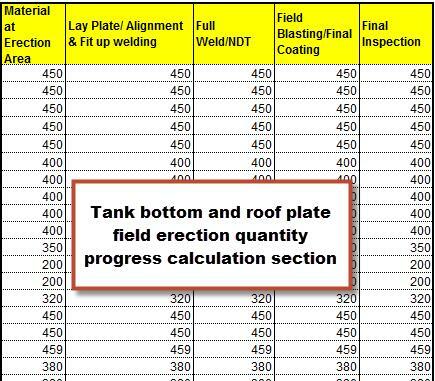 For your project reference, simply download the sample progress measurement sheet/system for tank farm mechanical construction work. This is really comprehensive detail and I am really impressed with the data showing Construction work steps for tank internal accessories and nozzle installation at site. Thank you for your effort Min Oo. Do you have something similar for checking E&I progress in an industrial installation? You are welcome. E&I Progress sheet is in our list to be published in future. Stay tuned for new post updates. When you want to use a cord to create a terrific electric powered fence, you need to significantly keep in mind the power of the cord. To this end, you want to pick out a fabric this is robust and durable- it holds up nicely in very horrible weather and will remaining for a time check out the post right here.